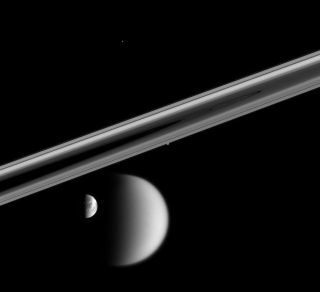 This view from NASA's Cassini spacecraft, taken in 2005, shows the edge of Saturn's rings alongside its moons Titan and Dione at the top, Prometheus near the rings at center, and Telesto as a speck above the center. After blasting through the effects-heavy chaos of a "previously on" segment, viewers watching "Star Trek: Discovery" last night (Jan. 17) were treated to a more realistic, awe-inspiring view of Saturn's rings, courtesy of the real-world Cassini spacecraft. The episode begins with a voice-over from the character Michael Burnham, played by Sonequa Martin-Green: "Space, the final frontier. Above us, around us, within us. We have always looked to the stars to discover who we are." As a backdrop to her words, the show airs black and white images from NASA's Cassini spacecraft, which returned beautiful views of the Saturn system before the mission ended with a "grand finale" dive into the ringed planet in 2017. The show puts an old-looking slideshow introduction before the photos, but they are our modern-day best views of Saturn's spectacular rings and moons. In the "Star Trek" universe, the footage from Cassini, in particular, "is archaic, the old way we used to look at space," he told The Hollywood Reporter. "Look how we evolved; look at how our understanding of and our place in the universe changes. I felt that was all embedded in that story, and I loved the visuals and emotional representation." The footage helps ground (metaphorically!) the episode — while the technology and circumstances may be fantastical, the character interactions and the sense of wonder at the cosmos echo the real world and real human potential. Even if Cassini is ancient history in "Star Trek" terms, it still offers the same inspiration. This isn't the first Cassini connection to "Star Trek." Carolyn Porco, a planetary scientist at Space Science Institute in Boulder, Colorado, who led Cassini's imaging science team, also acted as the official science consultant for the 2009 "Star Trek" film, contributing to a scene in which the Enterprise rises through the haze of Saturn's moon Titan. After the Cassini interlude and Burnham's reflection on an ancient story about the Milky Way's creation, the story jumps into high gear, with (among other things) a daring attempt to scoop a sample from a mysterious interstellar asteroid. Is it too much to speculate that this ends up being the recently discovered 'Oumuamua? It could journey pretty far in a couple centuries.